There has been a lot of speculation and discussion about Gutenberg. In this session we’re going to focus on the reality of what Gutenberg is, how to best prepare for its arrival, and how to build your own custom blocks for the editor. Throughout the session we’ll look at recommended build setups, the anatomy of a basic Gutenberg block, and how you can take advantage of the core WP components to build new blocks with remarkable speed. By the end of the session you should feel fully equipped to make your very own block. This session will help you get your feet wet and get started with Gutenburg development. 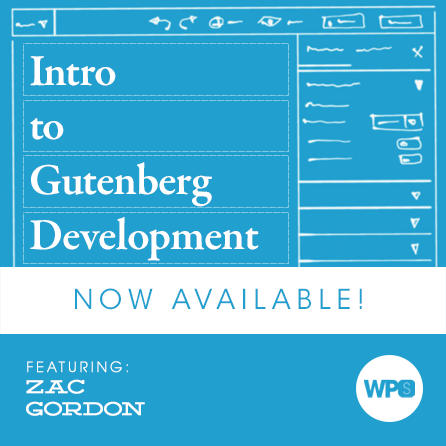 If you’d like to learn even more, Zac Gordon has built an incredibly comprehensive, multi-hour Gutenberg Development course that you should definitely purchase and watch.